Guelph, Ontario – May 9, 2013 – Have you ever wondered why some horses can naturally excel at a certain discipline while others cannot? Or why some breeds of horses are more susceptible to illness than others? Equine Guelph will be offering students the opportunity to understand the importance of genetics and how it can influence a horse’s ability to perform or render it susceptible to certain diseases, unsoundness or even a genetic disorder with its 12-week course, Equine Genetics. Since the mapping of the equine genome was completed in 2007, genetic research has now provided the horse industry with the proper tools to better understand how to care for our horses, how to utilize their genetic potential, and how to breed a better horse. Within this course, Winkleman-Sim says students will look at the biological basis of genetics, including what it is and how it is passed from parents to offspring; Mendelian genetics and how traits controlled by only one or two genes are inherited; as well as single gene genetic disorders that have been identified in horses, including widespread disorders such as HYPP (Hyperkalemic periodic paralysis) and HERDA (Hereditary equine regional dermal asthenia) in Quarter Horses and SCID (Severe Combined Immunodeficiency) in Arabians. Multigenic determination of coat colour and examination of gene action pertaining to performance traits and nature (genetic) vs. nurture (environment) aspects of performance traits, as well as how to select animals when breeding for performance, will also be covered. “As owners, trainers, caregivers and service providers in the equine industry, it behooves us to address the biology of the horse in developing programmes to maximize the quality of the horse’s life and to match horses with the careers for which they are best suited, thereby enabling us to make the most of our equine companions,” says Winkleman-Sim. 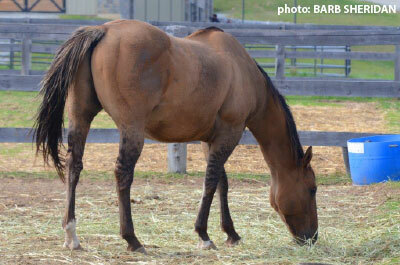 Equine Genetics is part of the Equine Science Certificate continuing education program and will be included in Equine Guelph’s Fall 2013 online lineup. Other course offerings include Management of the Equine Environment, Equine Nutrition, Equine Functional Anatomy, Equine Growth and Development, Stewardship of the Equine Environment, Equine Business Management, and Equine Journalism. Registration is now open, with courses running from September 9 to December 1, 2013. For more information, please contact Open Learning and Educational Support at info@OpenEd.uoguelph.ca, call 519-767-5000 or visit equinestudiesdiploma.com. Equine Guelph is the horse owners’ and care givers’ Centre at the University of Guelph. It is a unique partnership dedicated to the health and well-being of horses, supported and overseen by equine industry groups. Equine Guelph is the epicenter for academia, industry and government – for the good of the equine industry as a whole. For further information, visit equineguelph.ca. Open Learning and Educational Support provides expertise and leadership to the University of Guelph community and our partners in the following: the scholarship and practice of teaching, technology-enhanced education, open learning and professional development. We provide support for teaching and learning that is evidence-based, responsive, developmental and based on best practices.